Super Light with a road specific beam and a greatly increased output for 2019 season. Side illumination for 180° visibility and safety at junctions. DayBright flash pattern for daylight use to be safe, be seen. *new* Fast Charging has decreased charge time by up to 25% (Mains fast charger needs to be purchased separately). Controlling the temperature of the LEDs is important in ensuring that the lights remain as efficient as possible. 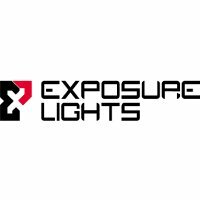 Patented technology in the circuitry of Exposure Lights stop the light from heating up to a point where the light loses power due to the elevated temperature. Patent Applied For. OSD advances unique Exposure Lights pat. pend. display technology. The new OLED panel gives program and mode information before switching to a burntime countdown. When charging, the OSD displays the percentage of stored energy in the cells so you know how long it is before you can get back to riding. Exposure Lights Fuel Gauge technology accurately displays battery power and burntime information so you can see how long you have left to ride. Patent Applied For.